Emerson has always been one of my favorite writers. Not only do I love him because he was an avid drinker, but I think his most famous quotes, for a lack of a better word, transcend the decades and are extremely applicable to most of life’s stages. As a young woman working in the corporate world, I thought that taking some of these and applying them to a millennial perspective would be enjoyable, and also demonstrate that even crazy woodland people can give sound advice once and a while (You hear that, mom?!). I’m a twenty-four year old girl; my verbal filter is at a minimum. I need a circle of people I trust so that when I say that I’d like to have wings and a tail, they take it at face value and don’t automatically commit me to an insane asylum. This not only resonates with twenty-somethings, but with the world. If you can’t laugh at yourself then what is the point of living? If you can’t tell something like it is, what is the point of talking? If you can’t cheer on your teammate, what’s the point of being on the same team? Life has tons of hurdles we have to surmount, but with these three pieces of advice, it can make life seem a little less dreary, and a little more exciting. Have you ever ridden public transportation or driven in a city? This one directly applies. Have a little courtesy, people! Crack a smile every so often, maybe even say hello. I’m not having a bad day, but I can tell you sure are because you’re grimacing at the speed of the Keurig for not filling your coffee cup up fast enough. If you told me that I would be twenty-four, working as a receptionist, I would have punched you in the face. I saw better things for myself. But realistically, everyone needs to start from the bottom in order to gain the necessary experience to move forward in life and your career. I had a slew of failed interviews, but it taught me how to answer certain questions and present myself better. I’ve learned that mistakes are inevitable and acceptable. If dealt with in the appropriate manner, there are always lessons you can take away from each. You shouldn’t be surprised that the kid you made out with at the bar doesn’t want to date you. The same goes for not getting the job because you showed up to the interview in sweatpants. Actions speak louder than words. Learn to present yourself in the way that you want to be perceived. Meg Lago writes for a blog called Half and Half, which can be found here. 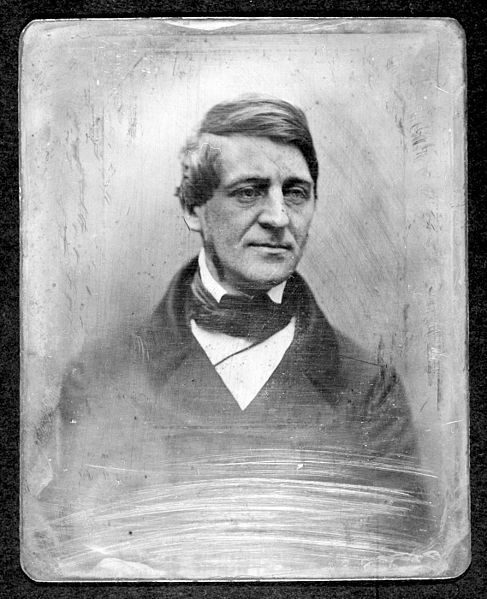 Image: Daguerreotype of Ralph Waldo Emerson, Wikimedia Commons, public domain. Wow, these are excellent… only knew and used one of them previously in high school! Good post, great writer, but I must say I wish he was less of a prude, like his buddy Walt Whitman. Hi Meg, I really enjoyed this post. I love how well you related the quotes to your own life. Thanks for giving me some new sayings! Meg, thank you very much for sharing! It’s a great perspective as we have all been in your shoes. I’m glad you have found inspiration in writing from many years ago and continue to share this with others. Life begins anew everyday and I have two words for you which Emerson would approve of: Carpe Diem – seize the day today. You’re young, enjoy life, try something new everyday. It opens vistas you never thought possible! Good luck! Reblogged this on 365(ish) Posts a Year. A wise man, that Ralph Waldo Emerson! :-) Love the life lessons! 24!! Wish I had been this wise at 24!! Great post. Keep writing! Great post! I love the quotes. Emerson is my go-to person when I need to refocus myself. Just opening one of his journals or essays, even his poems, often have a nugget of wisdom to offer me. His biography is quite inspiring. I was especially amazed when I read that Emerson opened his first wife’s coffin (Ellen) to view her body in death. He also open his son’s coffin (5-year old Waldo). What courage and desire to know all there is about life and death.